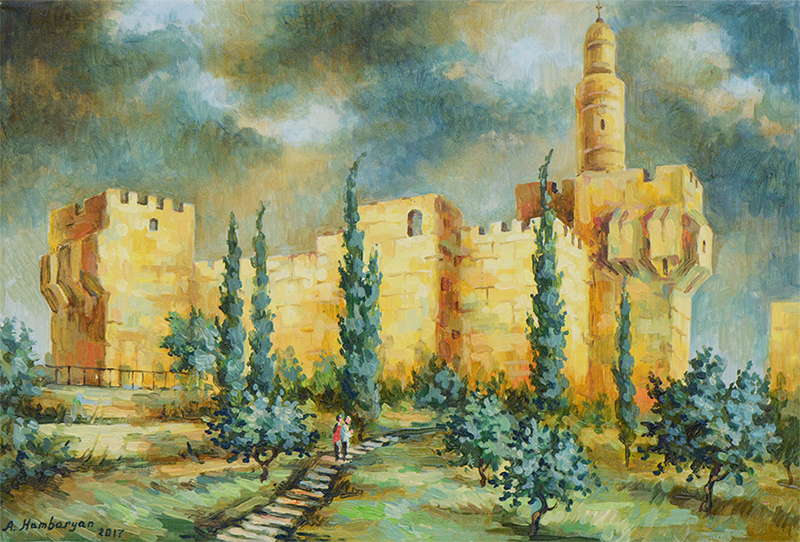 This oil on canvas painting portrays the ancient walls of Jerusalem’s Old City and the David Tower next to Jaffa Gate. The peaceful setting of the trees and shrubs contrasts with the bustling city within the city walls. Armenian artist Aram Hambaryan started painting as a child and attended art school from the age of 14. He went on to obtain a PhD in Art History in Armenia and worked as an art teacher before coming to Jerusalem in 2015 to lecture in History. He is inspired by the rich architectural heritage of the area that is the perfect backdrop for Aram’s talent for painting the stone walls and historic buildings of the Old City.